A large bin composting toilet system is made up of one or more toilet commodes, connected to a sealed container (bio-chamber), where carefully controlled biological activity breaks down human waste to produce compost. The following systems are approved in all 50 US states. 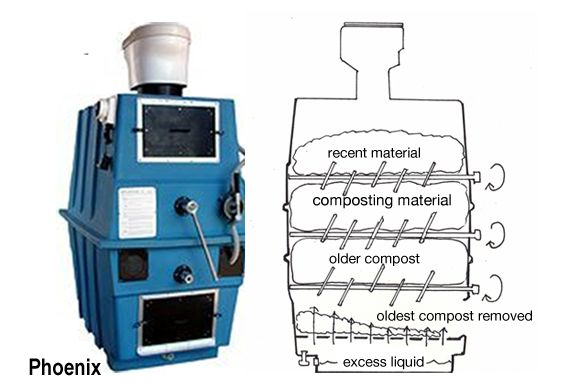 What the user sees when using a Phoenix composting system. 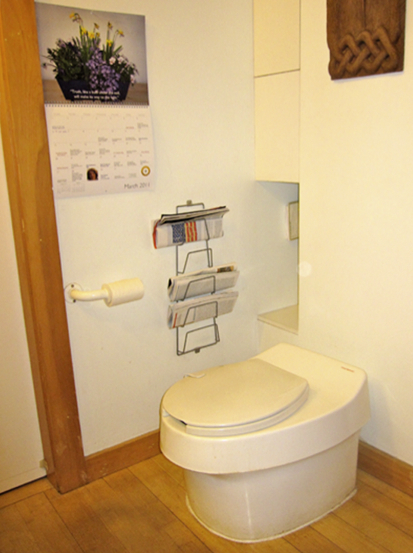 The Phoenix composting toilet system consists of up to four toilet commodes and one upright bio-chamber. Its low-energy fan (5-20 watts per hour) continuously circulates air from the toilet, through the bio-chamber, and finally out a chimney vent on the roof. The fan removes any odor from the bathroom and aerates the compost to improve biological activity. As fresh material composts over several years, it moves downward in the bio-chamber. If the excess liquid “leachate” is not manually recycled, it can be automatically pumped to the septic tank or to a storage tank for periodic removal. When using waterless toilets with the Phoenix, and regularly pumping the leachate back on the top pile, very little leachate will result. 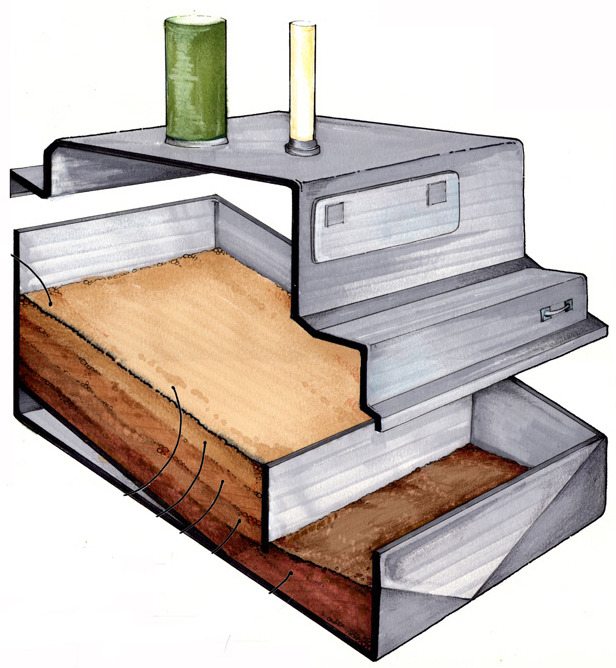 Inside a Phoenix composting system. Adding a cup of wood shavings into the toilet every day (on average), when in use. Manually turning a crank on the front of the compost bin once a week when in use, to mix and better aerate the compost. This optional manual operation can be automated. Operating a small manual pump on the side of the compost bin to spray any excess liquid (leachate) back onto the top of the “waste” pile. Doing so adds moisture and recycles the excess liquid, which is high in nutrients and micro-organisms beneficial for the composting process. Removing finished compost every year or two (depending on use). For more information, please visit the Phoenix manufacturer’s website. 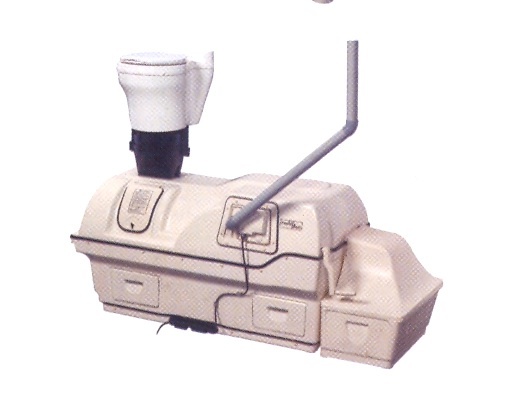 The Clivus Multrum composting toilet system consists of up to four toilet commodes and a large bio-chamber with a sloped base. It features continuous ventilation with a 20-30 watt fan, but no crank for users to mix the compost outside the bio-chamber. The Clivus automatically pumps excess liquid (leachate) to a storage tank next to the bio-chamber. From there, it can be pumped into an on-site septic tank or periodically picked up by a licensed hauler. A sensor warns the user or maintenance service when pumping is required. A cutaway view of the Clivus system. Adding a cup of wood shavings into the toilet every day or so (on average), when in use. Manually mixing the compost about once a month through an upper access door using a long-handled rake. Removing finished compost once every year or two. Please visit Clivus Multrum online for more information. The Sun-Mar Centrex systems consist of a large composting chamber containing a bio-drum that users rotate by hand every few days. A fan moves air continuously from the bathroom down the toilet, through the compost chambers, and out a vent. In the Sun-Mar, all liquids are evaporated using an electrical heater and fan. Average continuous power use is 200 watts/hour. In rare situations, excess liquid (leachate) is created in the system, which can be automatically pumped to a storage tank next to the bio-chamber. From there, it can be pumped into an on-site septic tank or periodically picked up by a licensed hauler. A sensor warns the user or maintenance service when pumping is required. 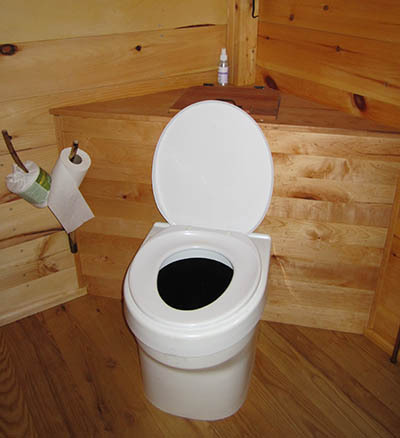 Adding Sun-Mar’s peat moss-based “bulking material” into the toilet. One cup per person per day is required, on average. Rotating the drum every two days (to mix and aerate the material) by turning the handle on the side of central unit. The peat moss bulking agent can be added at the time of turning instead of daily. Rotating the drum backwards every few months to empty some compost into the finishing drawer, where it remains to finish composting before removal. Empty the finishing drawer every few months to remove the finished compost. Please visit Sun-Mar‘s website for more information.